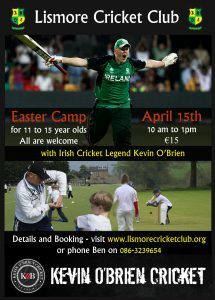 Welcome to Lismore Cricket Club – one of Munster’s oldest cricket clubs located in the heart of the farm grounds of Lismore Castle. Cricket has been played in Lismore since the 1850’s and continues through to this day. We are a vibrant, family orientated club that caters for all age groups and standards. For adults, we have a 1st XI and 2XI that compete in the the Munster Cricket Union League and Cup competitions, as well as a social team that hosts friendlies with visiting teams from across Ireland and the UK. Our youth teams play U-13 and U-15 tournaments, and we run cricket blitzes and fun events for the U-11 age groups. We welcome all who have an interest in this wonderful game, and support and encourage everyone who would like to get involved or give it a try. This website is currently under construction, so please re-visit later in the year or contact lismorecricketclub@gmail.com for further details. Lismore secure promotion to Division 2. (c) Lismore Cricket Club 2018.